Welcome blog friends to my springtime giveaway for 2012. You are all special and to tell you so, with a giveaway thank you, someone will receive my cottage white hand painted ceramic rose bunny. Just in time for Easter and beyond, this sweet little bunny girl is ready to hop on over to live in your cottage. To enter, please be a blogger and leave a comment on this post. If you are a follower that will give you an extra entry. Drawing will be March 29th and shipped promptly for Easter enjoyment. Have fun and thank you for playing along. hiya, I am a follower and love your blog, Your art work is so beautiful, can you add my name to your giveaway, please,. love from Glenda.. Please enter me in the giveaway!!!! I hope you have a wonderful weekend!!! Have a nice week end my friend,Your bunny is gorgeus! Love, love, love. She's gorgeous, Celestina. You are too sweet. Thank you for this lovely giveaway so very perfect for Easter and spring. Do count me in, love. And I am already a Linky follower too. Oh, what a cutie pie she is!! Your roses bring beauty to everything they touch!! Wishing you a joyous day. Little Miss Bunny is darling! I love her little "bonnet". Maybe she'll hop to my house! I do follow your blog and Thank you for 2 chances to win her! I have been looking for a bunny just like this so I am hoping that I win!! Thanks for the chance! Hi Celeste! Thank you so much for visiting me and leaving such a sweet comment about Savannah's party! I still cant believe she is already one! Seems like just yesterday she was born. They just grow up too fast. 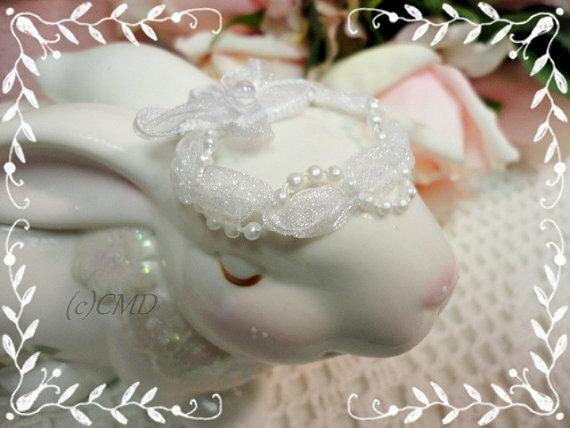 No doubt this sweet bunny-girl will find a new home with one of your followers and admirers. Enjoy a happy and sunny weekend. I also have a blog award for you on my blog when you get a chance stop by! What a sweet spring bunny! Sorry, forgot to say I am already following you. The bunny is so lovely! Hippity hop right into my jellybean basket for Easter! Of course I follow. I would love to win ms.rabbit. Thanks, Celeste! Oh Celestina, she is so sweet and so pretty just like you! I didn't realize you were having another bunny Giveaway! You should see what I shared today for Pink Saturday! Your bunny is adorable, by the way! Happy Spring, sweet friend, and enjoy your weekend. love this! Enter me twice as I am loyal follower too! Oh my gosh I would love to win this especially because I collect bunnies. I am a follower. I am a follower so here is my second chance. I love your bunny. How sweet and handpainted by you makes it even more special. Happy Spring my friend! What a beautiful bunny. I adore your work and your blog is full of yummy ideas. I would love to win this. I'm a new follower. Hi Celeste :) Oh yes, do count me in for a chance to win this sweet bunny with your beautiful handpainted roses! And you know I am one of your sweet followers :) Have a wonderful weekend! Aren't you the sweetest! What a lovely idea to have an Easter giveaway and what an adorable bunny! He (or she I should say) would go great in my studio. hee hee...I hope you're having a wonderful day. little bunny. How I would love to win. I am a follower and thanks for your sweet comments. My gracious Celeste, what a sweet offer for such a lovely little creature! You are so talented! Thank you for offering this cutie! What a sweet bunny...I just love bunnies!!! Thank you for having such a wonderful giveaway. I am also a follower! Oh, yes, Celestina! Do enter me for that darling rose-bud bunny! 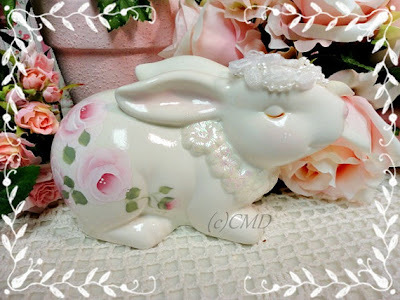 I just love your delicate roses and on such a sweet bunny for my springtime decor - yum! Hoping to be more active in Blogland come summer. Miss visiting everyday and soaking in so much inspiration! Good Morning Celestina, what a beautiful spring day it is. I love your pretty little bunny, have a wonderful Sunday, blessings, Maureen. Please do enter me into your giveaway. What a lovely bunny. I hope you are enjoying the first days of Spring. We are having such gorgeous weather, although I would prefer a lil cooler! Its so sunny I have been creating my little heart out. Just drop by to wish you a Happy Easter.The Bunny is just darling. I'm doing Ok and happy Spring is here with all its beauty and bugs to boot...LOL. Love your sweet rose bunny and one of your lucky friends are going to be thrilled. Hi Celestina, I would love to win your bunny and I am one of your followers. I enjoy coming by to see what you have been doing. Have a great day.Your Missouri Friend. You are so kind and so generous. One of us ladies is going to be one lucky gal. Hope you are enjoying Spring. We are in the upper 80s and supposed to be in the 90s by Friday. OMGoodness.... Of course include me!! If you draw Sherry-sis then I can't win it for her! Well,you know I follow you ... anywhere, sweetie. This bun-bun is just darling! You design the most beautiful pretties, Celeste. Oh definitely enter me Celestina!!! And I am a follower and have been for quite some time I am happy to say! Thanks so much for a chance to win this beautiful treasure.. Thank you so much for the opportunity to win this little hopper! she's a doll! Awwww, I was just poppin' in and had to drop down and enter for this precious little bunny. I collect 'em ya know. This one is purely precious. God bless you day sweetie!! !